to top of ch3 on beginning of row. Turn. (72dc + ch3) Fasten off. * rpt from * to * to last 10sc, work ch2, skip 1sc, 1dc in each of next 3sc, turn leaving 6sc un-worked. (10, 5dc blocks + 2 halves). ch2, skip 2dc, 1dc in each of next 2dc, 1dc in top of ch3. Turn. (10, blocks + 2 halves). Pattern Row 2 - ch3, skip first 2dc, * 6dc in ch2 space, skip 2dc, 1trcf around next trc, skip next 2dc, * rpt from * to * to last ch2 space, 2dc and ch3 to turn, 6dc in ch2 space, skip 2dc, 1dc in top of ch3. Turn. Fasten off. (11, 6dc groups). Pattern Rows 1 & 2 form the pattern, rpt both rows twice in main color and once in contrast color, you should have 5 complete patterns worked in all from crown. Fasten off. With RS facing rejoin main color yarn at neck edge, working in row ends and un-worked 6sc on 7th Row, start with ch3 and work one row of dc stitch evenly along to end. Fasten off. Finishing - Sew in and tie off loose ends of yarn, thread ribbon through alternate dc's along neck edge and tie in a bow. 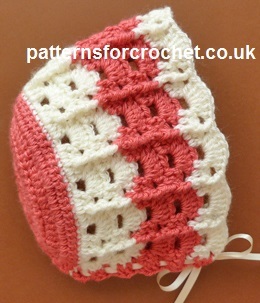 Hope you enjoy this free baby crochet pattern for a baby bonnet.